Event Sponsors Hytera Communications Corporation Limited - Professional Mobile Radio communications. 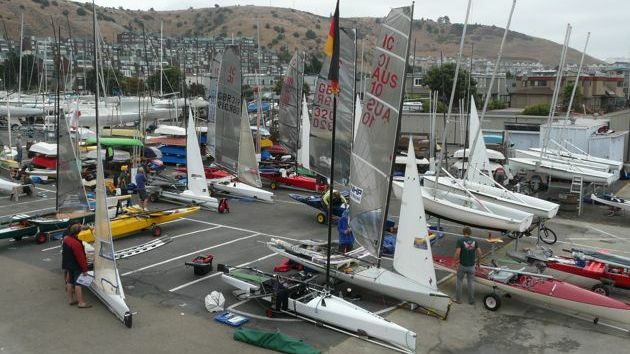 The practice race was abandoned due to hostile winds and seas. Yachts and Yachting Report Practice Race Day. VR Sport Video presentation of Day Zero and Tech Talk. Dave Timson photos on Facebook. Was held in 6 to 9 knots - lightish and shifty. Chris Maas (USA) led off the line, but it tended to pay to go left and Robin Wood (GBR) led at the first mark and thereafter. Chris took 2nd and Colin Brown (GBR) 3rd. 4th was Mike Fenwick (GBR) from Castle Cove, 5th Gareth Caldwell (GBR) and 6th Alistair Warren (GBR). Amusingly after the race the RC were planning a back to back second race, but the competitors decided they wanted hot drinks and lunch, and left them to it! Was therefore held in the afternoon, and if anything lighter with a nasty short boat stopping chop, and very nasty heavy rain leading to poor visibility. Robin Wood took an early lead from Peter Ullman (GER). Chris Maas came through to third by the end of the first lap. At the end of the run the wind shifted hard left after Robin had already started his beat. 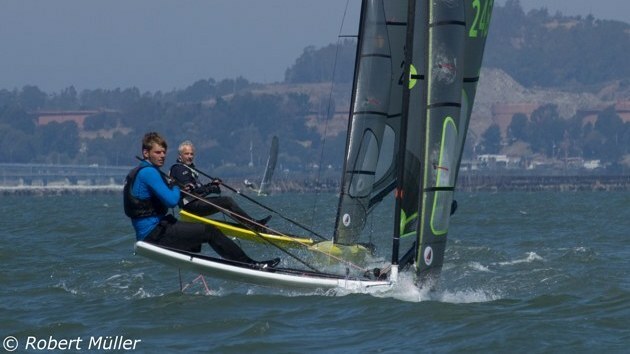 Everyone else got a fetch to the finish at the windward mark, but Robin had to put a short leg on the opposite tack in, leaving him behind Chris Maas, and only salvaging second by inches from Peter Ullman. Charlie Chandler (GBR) , Gareth Caldwell and Alistair Warren completed the top 6. VR Sport Video presentation of Day One. Yachts and Yachting Report Day One. The next day featured more rain, more gloom, and very hard to find marks. It was 6 to 9 knots again, shifty again and, what about summer? Chris Maas took an early lead, with Robin back in 6th. The rain got worse, the breeze got worse. Chris stayed in the lead with only Alistair Warren and Gaz Caldwell really in touch. Peter Ullman took 4th and Colin Brown was 5th. Robin Woods' race got no better, and he finished 6th. After lunch the weather actually improved. It stopped raining and the visibility improved. At times the wind speed got into double figures and the fleet were generally powered up. Robin led from early on, with Chris Maas chasing hard, but then Robin seemingly found another gear or his own private breeze and just got further and further away, winning by an immense margin. Gareth Caldwell got another 3rd, Mike Fenwick 4th, Alistair 5th and Colin Brown 6th. Yachts and Yachting Report Day Two. VR Sport Video presentation of Day Two. Results after 4 races - on the IC Worlds website. Started off light and shifting with rain to boot. Joy. 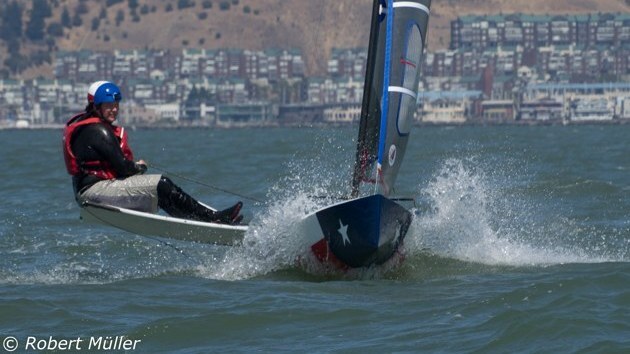 Robin Wood had a narrow lead at the first windward mark from Todd Twigg (USA) and Peter Ullman. Boats took a variety of angles on the triangle, with Chris Maas some way back from the leaders. The next slow beat turned out to be the last, and Robin won from Peter Ullman, Todd and Gareth. Alistair Warren took 5th and Charlie Chandler 6th. Chris... got what he hoped would be a discard. The afternoon race was abandoned with boats struggling even to get out to the course against the tide. VR Sport Video presentation of Day Three. Yachts and Yachting Report Day Three. Results after 5 races - on the IC Worlds website. Day 4 - New York Canoe Club Challenge. Well, there was a nice breeze, but it was still overcast. No race 6 was held, so don't get confused. 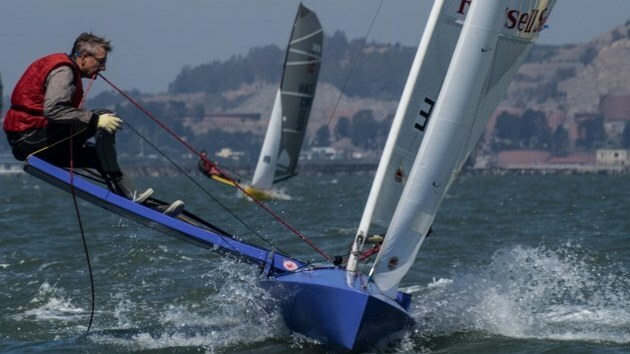 Race 7 featured a long swell from one direction and a short chop from another. Just the sort of thing to demonstrate - or pick holes in - one's tacking technique. Not everyone passed the test consistently. Robin led at the windward and thereafter. 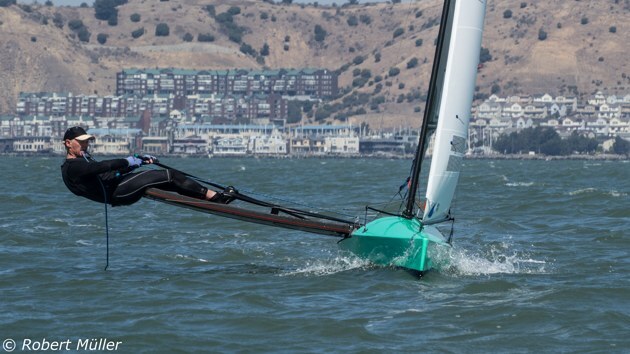 Peter Ullman was chasing, while Gareth was sailing in gingerly with no kicking strap. Chris took second place and then the sun actually came out. Scenery, sunshine and fun sailing. These two extended from the pack and finished 1st and 2nd. Alistair was 3rd, Colin Brown 4th, Todd 5th and Mike Fenwick 6th. Still sunny, 10 to 15 knots, first dropping then increasing. Robin held most of the cards, and Chris Maas needed to win. The chop and the swell were still competing, and the tide was helping so it was rather challenging. Few avoided sail washing. 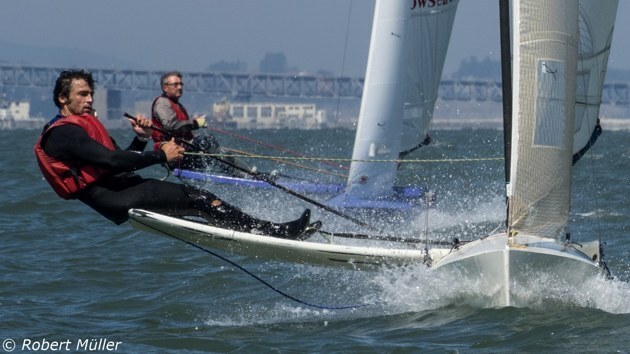 Alistair Warren inherited the lead at the windward mark when Phil Robin (GBR) succumbed. Robin had tipped it in earlier, and Chris Maas, Todd and Gaz were the next round. On the 3rd beat Gaz overtook Todd for 3rd, while Robin was still well back and things looked promising for Chris. Peter Ullman was catching this leading group. Alistair and Chris were neck and neck coming to the line, Chris with the advantage, when, feet short, bang! Chris' sliding seat had snapped clean off leaving him unable to even finish. Alistair took the win, from Gaz, Todd and Peter, whilst Robin snuck in for 6th, which, with only one more race scheduled, was good enough to secure the series with Chris having just had a probable race win turn into a second discard. VR Sport Day 5 Video presentation. Yachts and Yachting Report Day 5. It dawned grey again, 18knots at times, decreasing a little. This featured probably the roughest sea of the event, and two tack beats were the order of the day for many. Robin was absent - and not the only one. Alistair led from Chris M, Todd, Gaz and Charlie Chandler round the first triangle. Gaz' mast went on the second triangle, giving him a second DNF and a lower place in the rankings than he perhaps deserved, although I imagine the NYCC cup is something more than a consolation. Charlie took 3rd then, Todd 4th Chris Hampe (GBR) 5th and Peter 6th. VR Sport Final Day Video presentation. It would be really good to have a whole lot of paragraphs, sentences, essays, whatever from folks all over about how the worlds were for them. As a starter here is something from Willy Clark, first posted on SA. 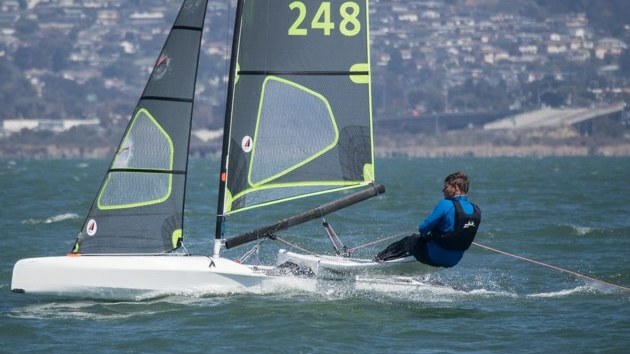 Robin sailed a wonderful regatta and took home his fourth IC World Championship, edging out Chris who had a couple tough moments which cost him. Robin has bought Chris' boat Black Betty, so may be getting even faster! The rest of the IC fleet trembles at the thought of it. Meanwhile Chris will be building another new machine. The only thing that has been determined is the color (electric orange). Gareth sailed two absolutely terrific races to take home the New York Cup. Chris and I fought hard with Alistair, but Gareth was out of reach. 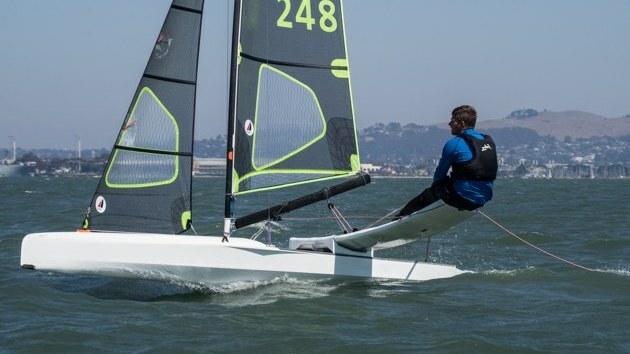 He's going really well in his Maas design put together by Andy Patterson, and sailed a great regatta before a breakdown in the final race cost him a potential spot on the podium. Colin Brown is also fast as ever in his Maas/Patterson boat. Guy could pass me on a reach in his sleep. Further updates from the UK - the new Morrison design looks pretty flash. Dave Timson, Chris Hampe, and Steve Clarke are all going well. Meanwhile Alistair's Dragonfly design seems to be getting better every year. He has gotten even faster down reaches. Furthermore he and Phil never seem to capsize. Three 3rds in three tries for Alistair. Charlie Chandler and Mike Fenwick are making their M1s go fast. Finally John Ellis' design is pretty sweet and points like a demon. As for the Germans - Peter Ullman is as fast as ever. Flies down reaches, and seemingly sails directly into the wind on the beat. He's fast AF. And he just bought himself a new hull from Chris. Annette did well in String Theory (boat still beautiful). Meanwhile a bunch of the younger Germans (Anton, Emma, Hauke) are all making strides. All competed well. And Freddy spent the week measuring everything in sight so he can build himself a new design. The Aussies - Brett "The Thunder from Down Under" Holly may have had more fun than anyone at the regatta (both on shore and on the water). And in between capsizes Stefan was f---ing fast in Hellcat (borrowed from Lt. Steve Gay of the USA). Lots of excitement from Oz for the next Worlds. And finally, for the USA - Chris had some brilliant moments. Had a couple of unfortunate setbacks which cost him. Todd was a force in the heavy air. Struggled a bit with the chop in the light stuff. Dad was quick in the light stuff in Machete. Not as quick in the heavy air. I meanwhile suffered the expected new boat breakdowns which happen when you show up to a regatta with a boat you've never sailed. These issues were compounded by me twisting my ankle falling off Anton's skateboard on Wednesday (I'm too old to be this stupid. Was having too much fun). In the times when I had my act together, the boat felt really really fast. But obviously it wasn't much of a regatta for me. Knew it going in, and had a good time in spite of it all. We're thinking of pulling a mold off Bagheera (Carbon version of Dance Commander). Those interested in a pulling a hull let me know. Also Dance Commander and Machete are for sale to the right buyer (we'd love to keep them on the east coast if at all possible). My overall thought on designs is - it seems that they've gotten close enough together that it's mostly down to the quality of the sailors, which is what you'd want. 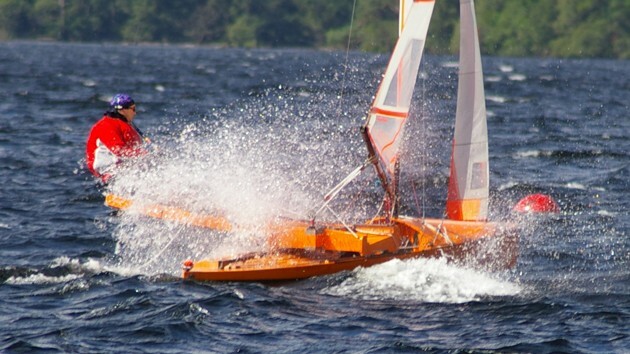 Different designs and different sailors excel in different conditions. Great week. Went by too fast. Can't wait for 2020 in Australia. 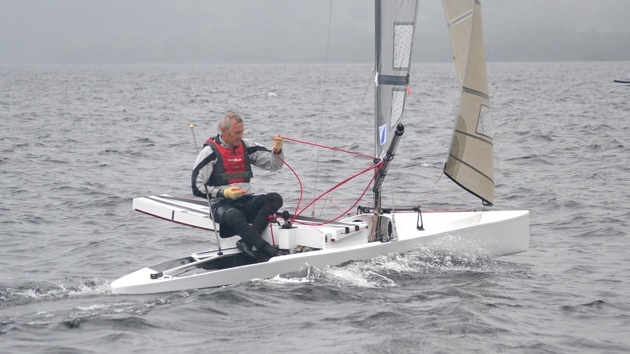 A special congratulation should go to Mike Brigg (GBR), who sailed the 50 year old - and 100lbs overweight - K102, finished every race and even beat a handy number of much more modern boats in Race 5. Gear Chart - designs, manufacturers, equipment used by the competitors. Results as posted on the Sailwave website. Some Photos on the IC Worlds Website. Lots of Robert Muller photos on the Team Germany site. Some Photos on VR Sports Facebook page. Inteview (in German) with Team Germany. Team Germany's Blog is great, even if you have to use Google Translate to read it! There are also photographs at Green Sea Photography, but the site seems to require registration, including an email address, before you see anything of any consequence, and so I can't provide good links to the IC images.